Mr. Levidzhov can only be described as a super fan, as the huge Manchester United fan has won a 15-year legal battle to officially change his name to Manchester Zdravkov Levidzhov-United. To celebrate the landmark occasion, he had that little beauty (it’s not really that subtle, is it?) tattooed on his forehead. Now when he is asked his name, according to the story from the Sun newspaper in the UK, Levidzhov simply points to his forehead and laughs. According to Soccerly reports, this dude has taken fandom to a new level. We can now call a fan in Bulgaria by the name of Mr. Manchester United as a man just won a 15-year legal battle to change his name to that of the club he so dearly follows. To celebrate his official name change, the Bulgarian fan once in for all made sure everyone knew what is most important in his head, literally. Officially his name has changed to Manchester Zdravkov Levidzhov-United, but it will be easier just to call him Mr. Manchester United. 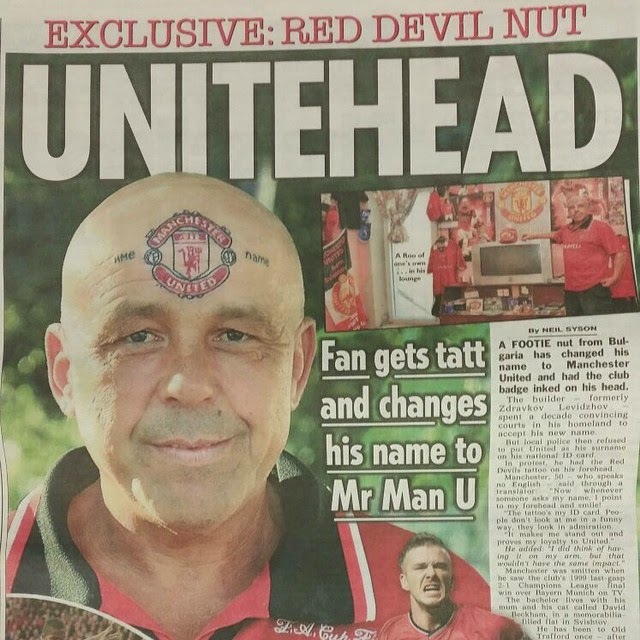 In an interview with The Sun, Mr. Manchester United proudly stated that when people now ask his name, he just points to his forehead andsmiles. He also affirmed that there is nothing silly about his tattoo. 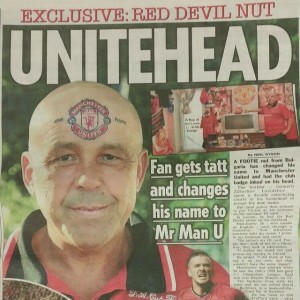 “People don’t look at me in a funny way, they look in admiration,” said Mr. Manchester United with a confident look in his face- that same confidence which convinced him to tattoo his forehead with the club’s crest.